We find that we are asked to cater for a wide variety of different groups. Here are some of the real life scenarios that get played out down on Bridgefield Farm. Uh ... What's good for the Gander is good for the Goose. It can be great entertainment just being an observer at these events never mind being involved. We've seen all sorts, but there's no question, the consensus is always a big thumbs up from the lads! 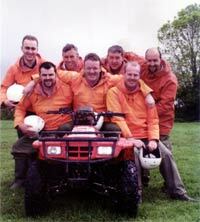 Bridgefield Buggies original quad bike safari is unquestionably productive for your business. Especially in situations where groups of people work together in offices. Every once in a while sending your entire staff off on Cross Country Safari equals rip-roaring good fun for them, equals de-stress, equals greater efficiency and co-operation in the workplace and greater customer satisfaction, equals repeat business, equals greater Profits! Yes, The Bridgefield Buggy Experience may very well increase Corporate profits putting a smile on shareholders faces & thereby putting bonuses in Managers pockets!!! Think about it! We've had plenty of family groups down here in the past. Have you ever seen the look on the kids faces when you say. "You'll never guess where we're going today kids ...!" "Where,where, tell us, tell us, where are we going?" (jumping up and down). Whether its Mum or Dad that tells 'em, no matter, instantly your credibility rating goes through the roof! There's a unique adrenalin buzz from being the Best Mum & Dad in the World isn't there? Never been there? Get on the phone to The Bridgefield Buggy Experience like now!